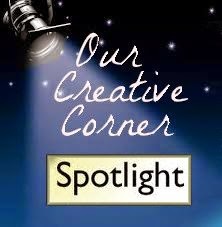 Hi everyone - It is Sponsor Spotlight time again at Our Creative Corner! 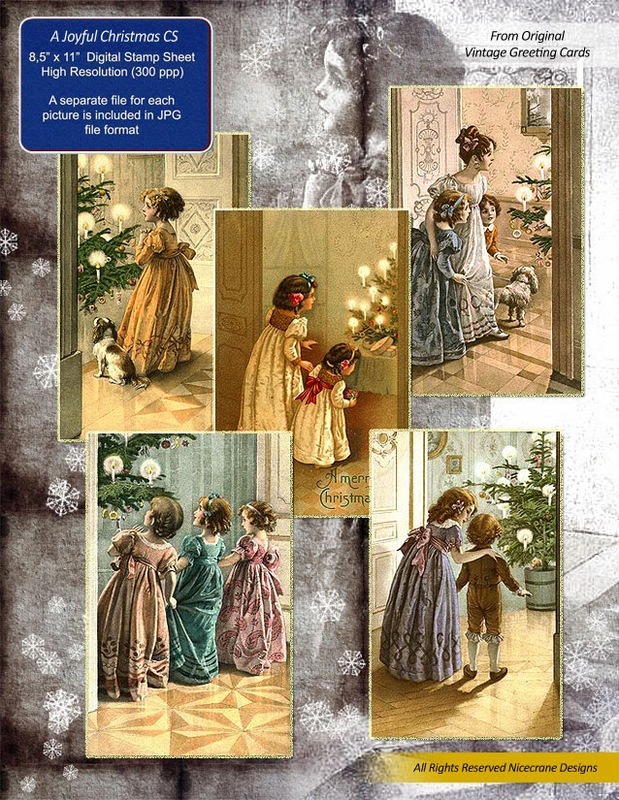 I chose some gorgeous images to use! 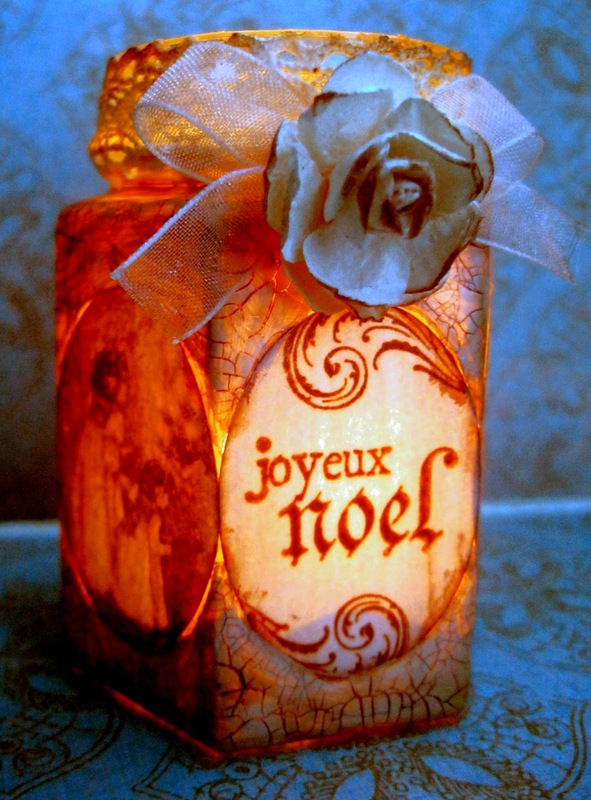 I had a small glass jar that I thought might make a nice tea light holder. 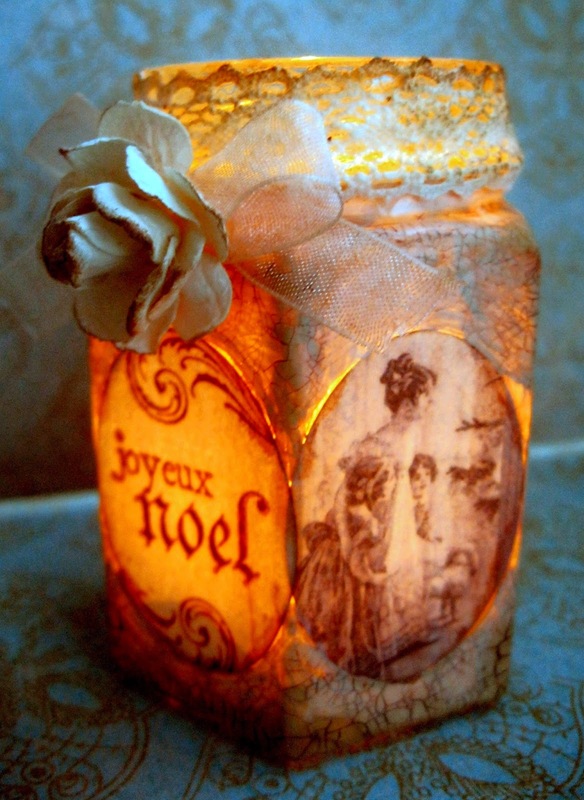 It was put away for the right time and when I saw these images from Nicecrane Designs I knew I had found the perfect thing to decorate the tea light holder. The first thing I did was change the images to sepia, which is very easy to do using any photo editing program. I then cut out the images with an oval cutter that I have. I stuck all the images onto the glass jar with Matt Multi Medium. 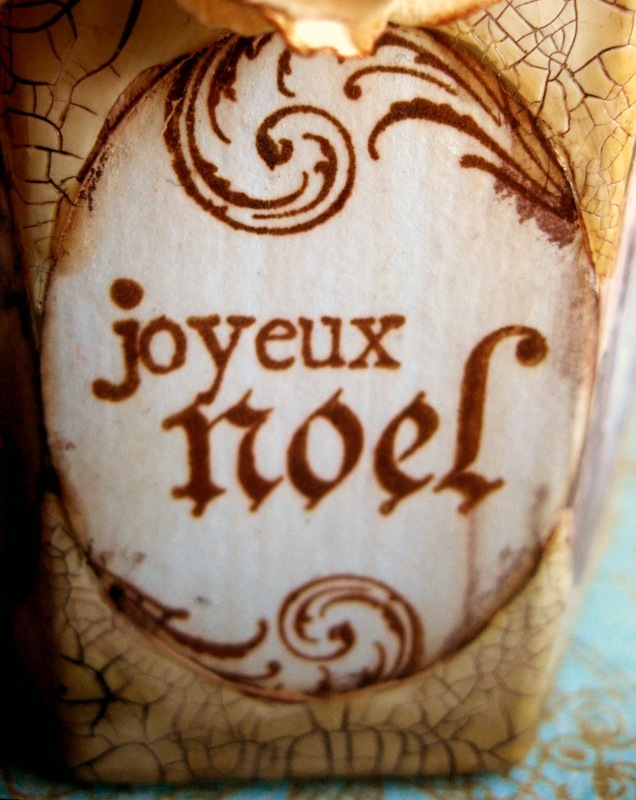 I also used one plain paper oval that I had stamped 'Joyeux Noel' and some flourishes in Potting Soil Archival ink. This was stuck onto the glass with multi medium too. 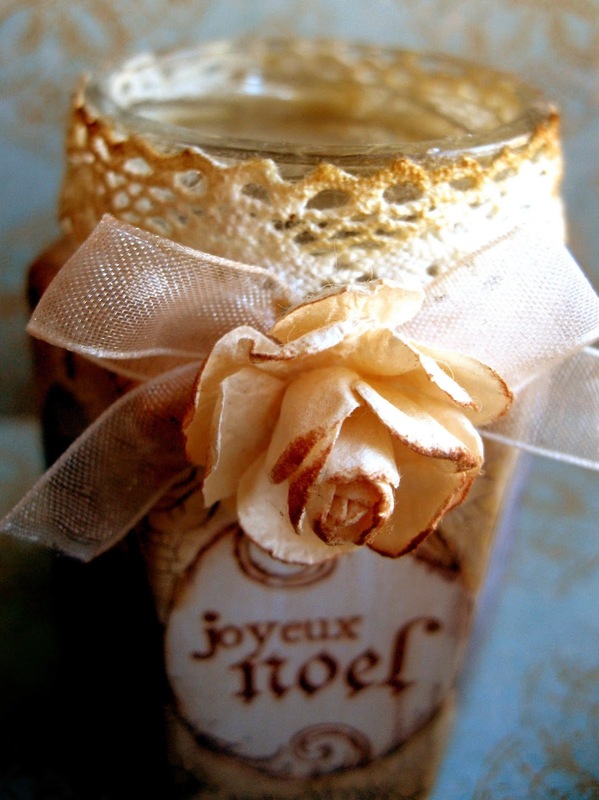 Then I painted all around the the glass jar with a couple of coats of Nougat Fresco paint. When doing this I wasn't planning on being too 'neat' - I wanted it to have a slightly antique, chipped and cracked appearance. After dabbing the paint with some Gathered Twigs DI, I covered the painted area with a coat of crackle glaze. 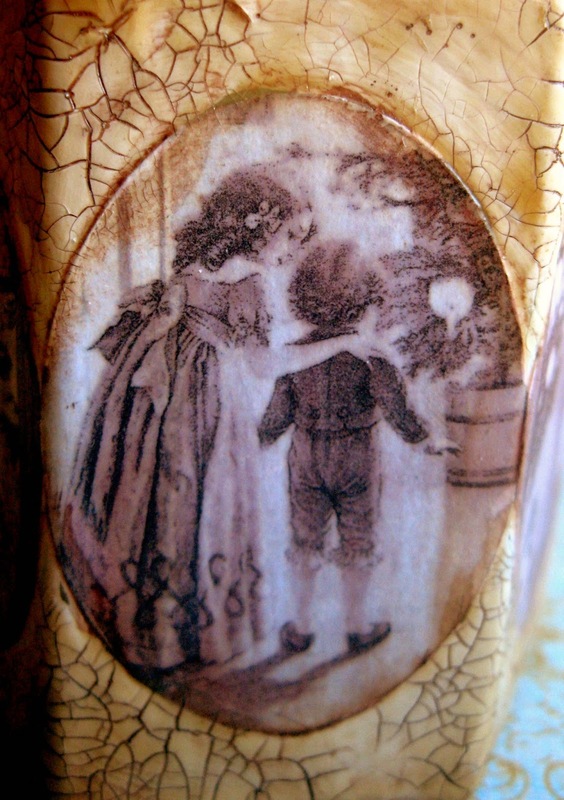 When the glaze was dry and crackled, I rubbed in some Chocolate Pudding Fresco Paint and wiped away with a baby wipe. The jar was then given three coats of matte varnish. 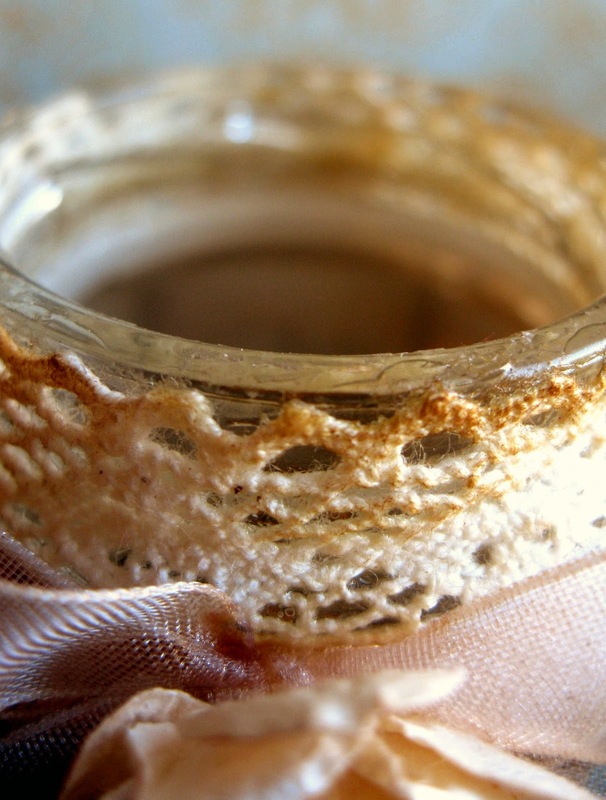 Lace was stuck to the rim of the jar and a bit of Vintage Photo DI was smudged around the edges. .......and there we have a Vintage Christmas decoration! Hope you liked it! 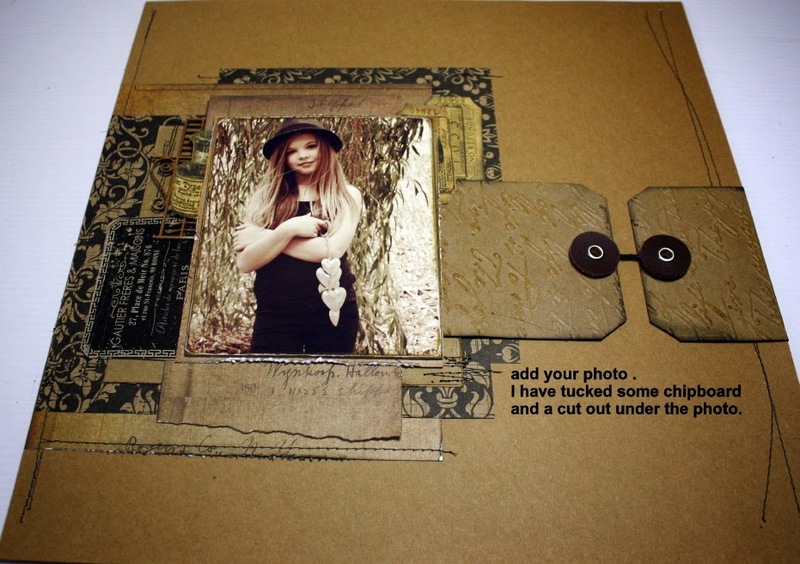 To be in with a chance of winning some wonderful images from Nicecrane designs just join our 'It's Magic' challenge hosted by Kerstin! This month we are shining the spotlight on the winner of the 'Autumnal Image Inspiration' Challenge that was hosted by Claudia! Claudia selected Bonnie as her winner and so we are thrilled to be welcoming Bonnie as this months Top Talent - for the second time!!! Will Bonnie be the first person to win the Gold Winners Badge? 1. 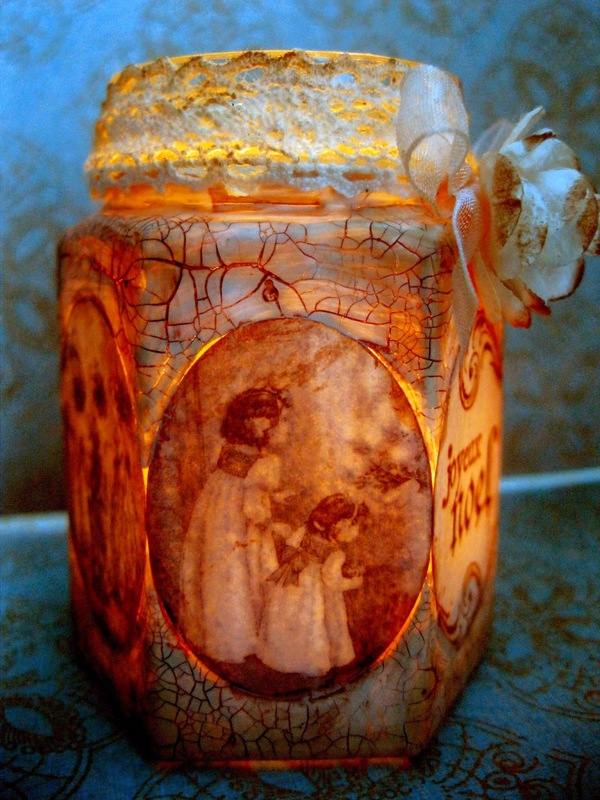 How long have you been crafting and what made you start crafting? 2. What is the most useless item that you have purchased for your craft? I use to live in Greenwich Village in the 60’s… and we use to try and raise money for different community affairs, and so we use to draw on the sidewalks with chalk and have a coffee can near us… there use to be 10- 15 of us… and we would all be working on each others art… it was very rewarding, learning, and loving in so very many ways… I learned so many different wonderful techniques, drawing skills, loving feelings about others, and also the art of enjoying people of all kinds. We are all so very wonderful when we connect with our hearts and allow that energy to flow out to others. Since that time, I have loved following my BLISS… which is my art of life. This is one of the reasons that when I became an Art Therapist, I was so very comfortable with that profession. 4. Whats the best piece of advice anyone has ever given you? To follow my BLISS in all ways, at all times. 5. What one thing have you not done that you really want to do? Have a successful etsy store… LOL.. truth. I use to have a few spare guest rooms… and one is filled with all my art projects that need homes… from cards, (over 2000 cards) tags, boxes (over 200 plus), books that need to go to people to fill with their pictures, little art books from challenges, Journals that I have made, jewelry, framed Zentangles, way to many zentangles unframed that need to also find homes… (well over 500) and the list goes on and on… and then I found huge bins of things that are all vintage from my Mother and MIL that need to find homes too… OMGoodness.. will I ever have this spare room back??? So I am trying to have a successful etsy store now…if you would like to visit and take a look… you might even find something that you would like to make room for… I am at Love, Light and Peace on etsy. I am very prolific so I think I will have things to sell for at least a few months… LOL… what do you think.. maybe a generation or two also… I love to create. 6. Is there something you wish you were better at? Yes… a lot of things… mainly following my BLISS all the time… I love to do my art with paints, inks, paper and scissors… but I also love to cook… I have written a few collaged cook books that are selling pretty good… Cook Your Art Out and also Cook Your Art NOW… but I would like to write a book that is very detailed with the ART of Cooking in the truest sense… creating with what you have on hand. Sort of like creating a piece of Jewelry with something you have on hand.. that is why I have created this piece of jewelry today… it is something that we can all create… very easily, with things that we have on hand… think about it as you look at this necklace… HOW CAN I MAKE THAT… I would do this differently and this … and I would add this and that… and now that you have that in your mind, make it… I would like to be able to teach that to others to do with cooking, living, and also in the arts… so very important to become self sufficient in so many different things on this particular Earth Walk… making a statement of Love, Light and Peace. Creative, Energetic, loving, artistic, prolific!!! I need to balance MORE… and am working on that NOW. Balance in all things. Thanks so much for being here Bonnie! We are so glad to have you here with us for a second time. 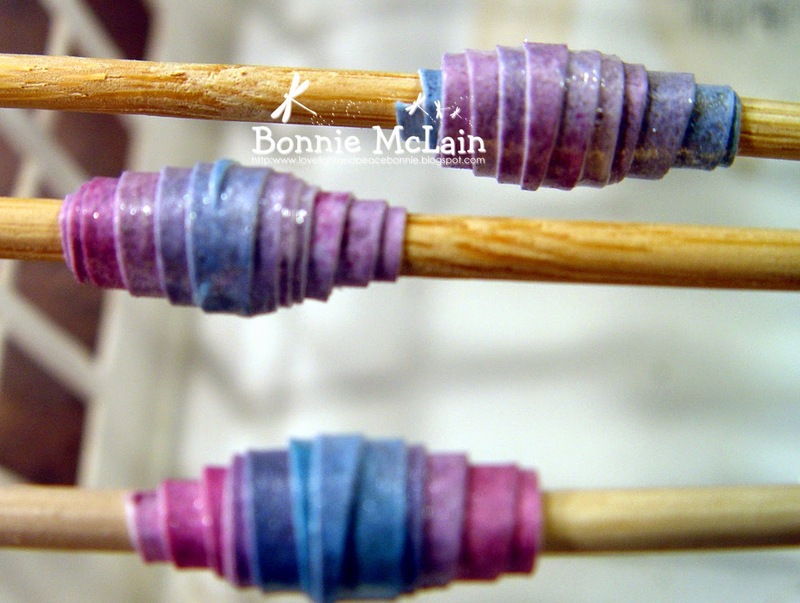 ....now it is time to shine the spotlight on the Top Talent creation - So let's see what Bonnie made for us this time! I love this Bonnie! 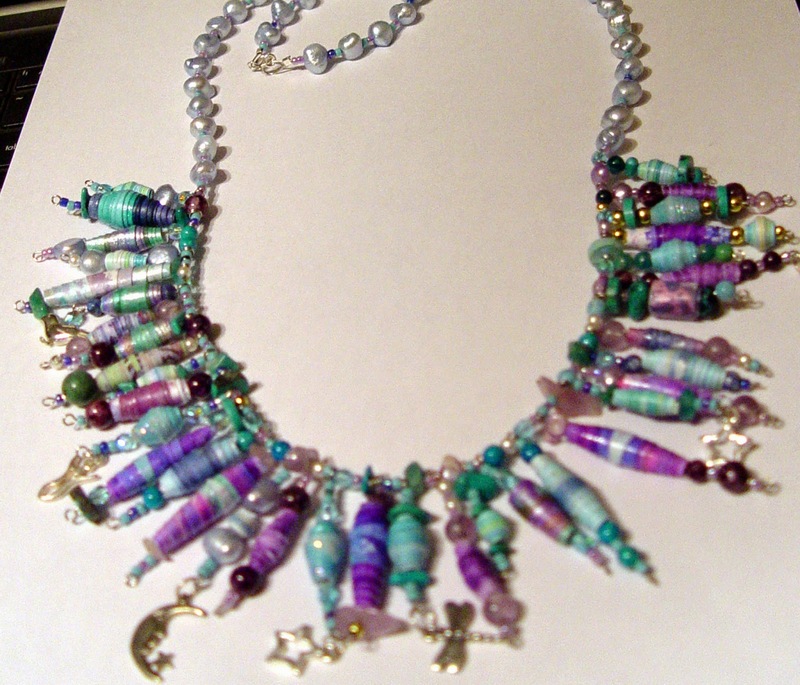 This is such a gorgeous necklace - I am sure you will be inspiring many people to have a go! 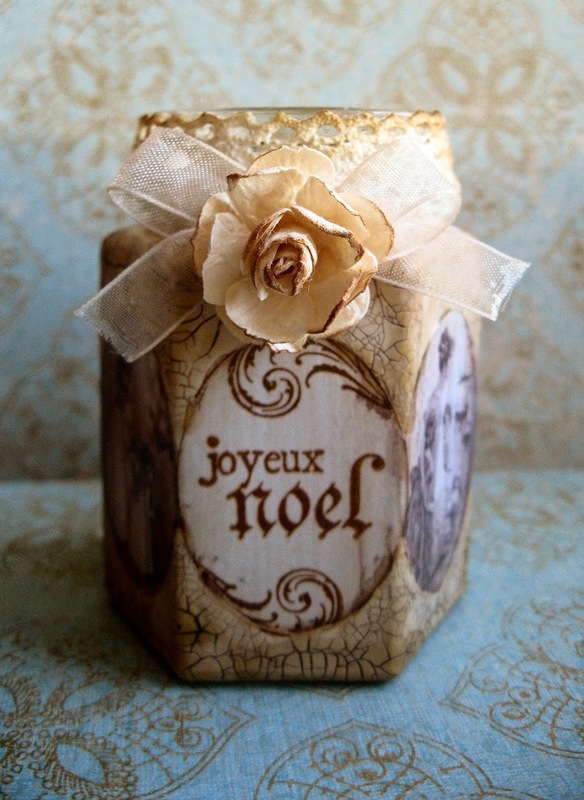 It really has been such an honour to feature this wonderful creation at Our Creative Corner. Thank you so much for being such a wonderful Top Talent in the spotlight! There is one more week of the It's Magic challenge left, so why not have fun creating! Hello everyone, it's Alison (butterfly) here with the second Sponsor Spotlight of the month, and we're turning that light on to Nicecrane Designs. If you've never explored the huge range of printable images and collections available at Nicecrane Designs, it's high time you did! 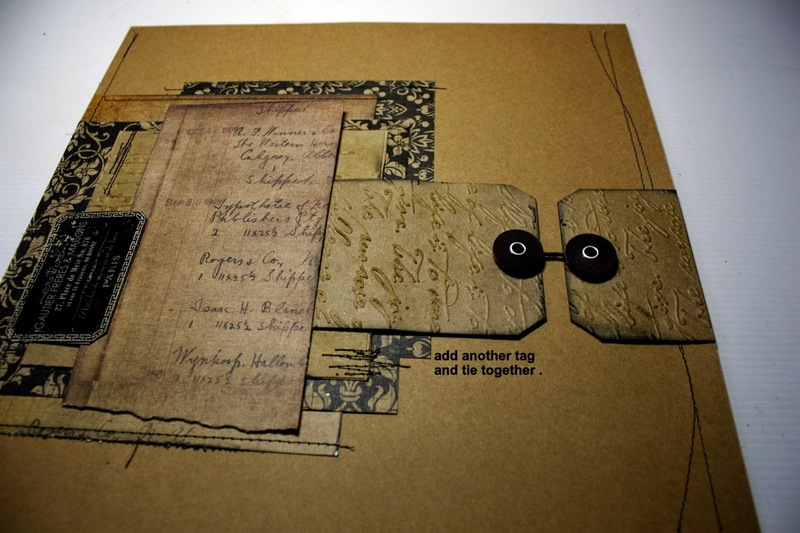 If you're not a scrapbooker or card-maker, you may have thought printables weren't really up your street. 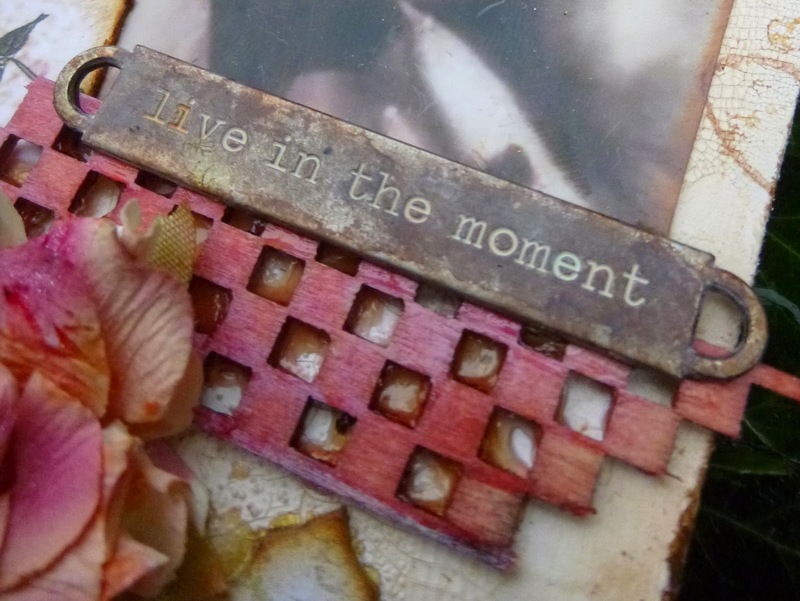 I hope to show you today that they can play a role in mixed media crafting too. Here's just some of what I've been creating... It may be time to grab a cup of coffee! I was playing with the Vintage French Postcards - enchanting black and white designs with a delicious Parisian feel. I started very simply. Once I'd downloaded the individual files, I put them all into a Word document and re-sized them to approximately ATC size, so that all six were on one page - almost exactly as the preview picture above shows them. Then, rather than printing onto plain paper, I chose an A4 sheet from the Prima Cartographer pad and printed them directly onto that. A bit of simple cutting and inking and I now have six great little cards/tags to insert into a scrapbooking layout or to include in a layered vintage-style card. (The four on the right are inked already; the two on the left are still in a nice pristine state.) 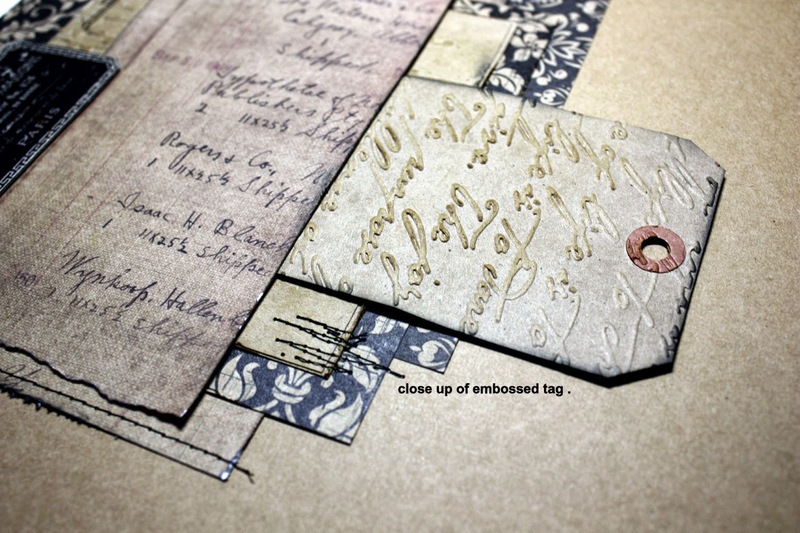 Homemade ephemera in an instant! Once printed and trimmed free of the taped edges, I tore around the images. If you have a torn edge rather than a sharp cut it's much more likely to "disappear" once you've glued/painted/spritzed around it. My plan for the larger of the two images was to make a shabby chic style wooden hanging. I started by coating a wooden plaque with DecoArt Chalk Paint, mixing Rustic (basically brown) and Relic (a dark grey) directly onto the wood. The next layer was a coat of the American Decor Crackle Medium - specially formulated by DecoArt for their chalk paints - and then a topcoat of Everlasting (a.k.a. white!). 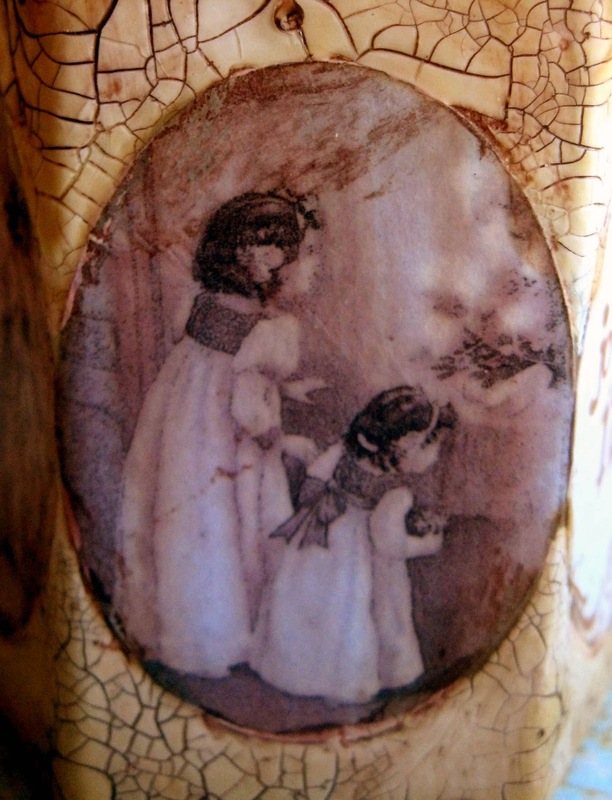 Once it had dried and crackled to my heart's content, I used Vintage Photo Distress Ink to warm-up the edges and give it that shabby age-stained look. I applied multi-medium to the reverse of my tissue paper image (not to the plaque as the moisture would make the Distress Ink run) and smoothed it down onto the wood. Once I'd made sure there were no wrinkles, I applied the multi-medium over the top too to seal it. I love that you can clearly see the crackles through the image, giving the impression that the whole thing has weathered together over the years. ... and added simple rustic twine to hang the plaque up by. Next, a tag (of course!) which uses one of my patterned paper ephemera pieces as well as the tissue paper printing, this time over a different crackle medium. For this one I started by applying DecoArt Crackle Paste to a large tag with a palette knife, and leaving it to crackle. Well, I say leaving it... It got going with the crackling as it dried, but time started to press, and I decided to see if I could help things along with the heat gun in the places where I'd applied the paste more thickly. Lots of crackle mediums don't like being hurried, and sure enough the crackle was a bit reluctant to play ball under the added heat. However I did get this fabulous bubble effect instead - just as much fun! Patience is a virtue, but impatience leads to happy accidents. I gave the whole tag a wash of white paint, and then applied multi-medium to my medium-sized tissue paper bird in order to stick him over the crackly top half of the tag. 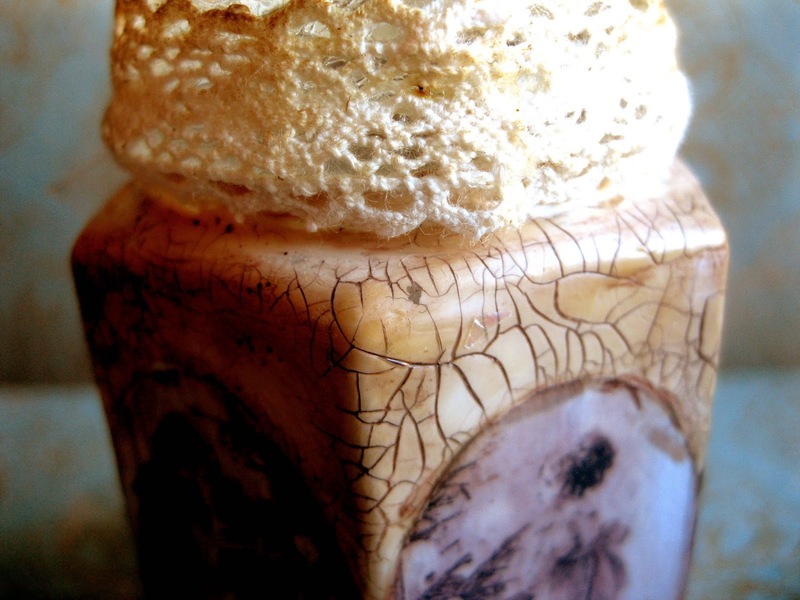 The much subtler texture where the paste was fairly thin gives a lovely porcelain crackle effect to the image. Once it was all dry, I applied Vintage Photo Distress Ink with a blending tool to highlight all the different textures. ... and set to work to do her justice with the embellishments. I altered some paper roses using sprays made up from Luminarte Primary Elements powders in Hopeful Honeysuckle and Hot Cinnamon, as well as a spritz or two of Tattered Rose Distress Stain Spray. I broke up the Prima wooden chequerboard embellishment and spritzed it with the same sprays to create a base for the flowers. And I used Ginger and Rust alcohol inks to tint the Word Band before smoothing on Antique Linen Distress Paint and wiping it back to leave the paint just in the lettering. The Idea-ology Plaquette has had a drop or two of the same alcohol inks rubbed in to mute the bright white tone. The Trellis Framework bits from another project have been sitting around for ages waiting to be used up. They toned in perfectly with the palette here, and I added some flourish stamping around the edges to draw the eye inward towards that fabulous bubble texture! And the seam binding at the top was gathered up from the tiny packages included when you order from The Funkie Junkie Boutique (last month's sponsor here). They were all a very delicate pink, so I spritzed a couple of them with the Hot Cinnamon and Hopeful Honeysuckle, while leaving the others pale and pretty in between. So there you have it - printables used in pretty much their simplest form, as well as with crackle mediums, paints and inks. 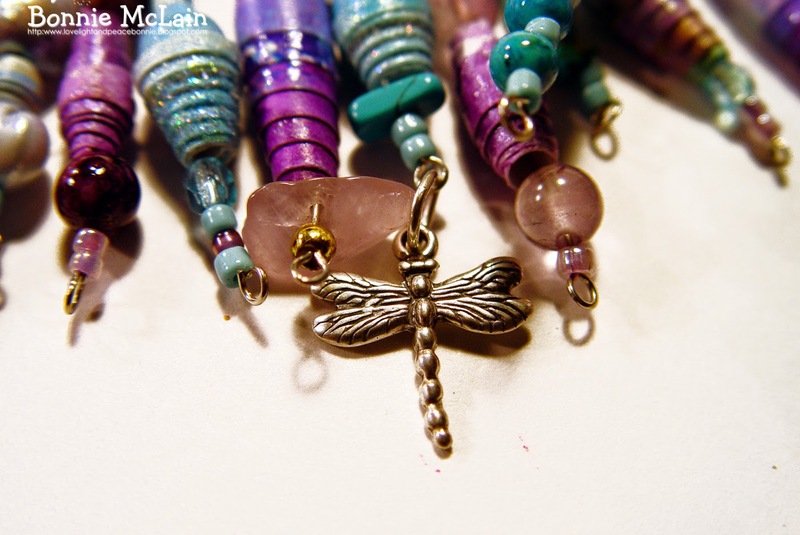 I hope you'll check out the other Sponsor Spotlights here this month, and do visit Nicecrane Designs to see what they could add to your crafting. And if you enter this month's Our Creative Corner challenge, It's Magic, you might be lucky enough to go shopping there with your prize draw winnings! Check out all the details and come and play along here. For now, thank you so much for stopping by, and happy creating all! Today I have the special honour to present our November Guest Designer here at Our Creative Corner! I am really proud she said "Yes" when being invited over to Our Creative Corner! 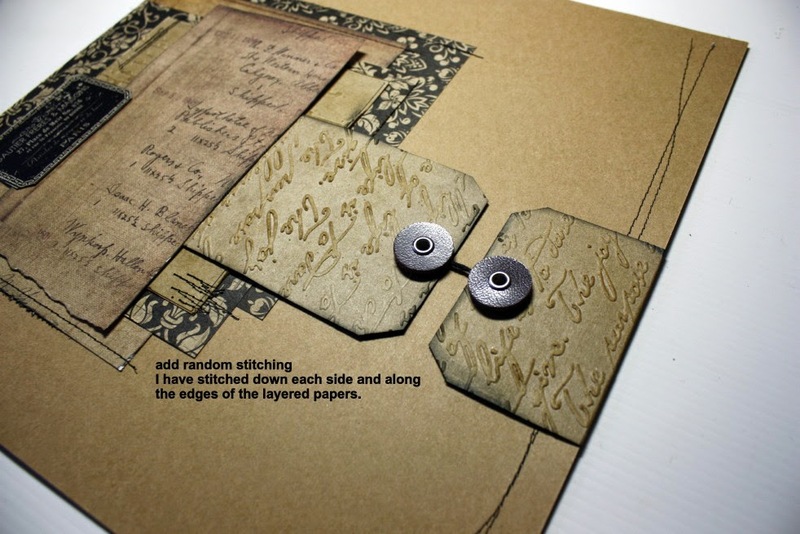 I have been admiring her work ever since I discovered scrapbooking and her special way of doing it! She has an incredible talent for composition and I love how she works with colours and textures! Her layouts speak of her love for nature and family and it shows especially with the love and labour she puts into detail. I adore the wonderful monochrome vintage colour schemes she creates and her grunge or shabby chic style. They're perfect! Her work never fails to inspire me as it always tells of freedom in self-exploration through art. Something I truly admire with art in general. I am so grateful that Heather followed my invitation to share some of her fantastic art with us today at Our Creative Corner! Hi there everyone and a warm welcome to Our Creative Corner. I was both thrilled and excited to be asked by Kerstin to Guest design for the month of November. Thanks so much Kerstin, for including me with a bunch of talented creatives . 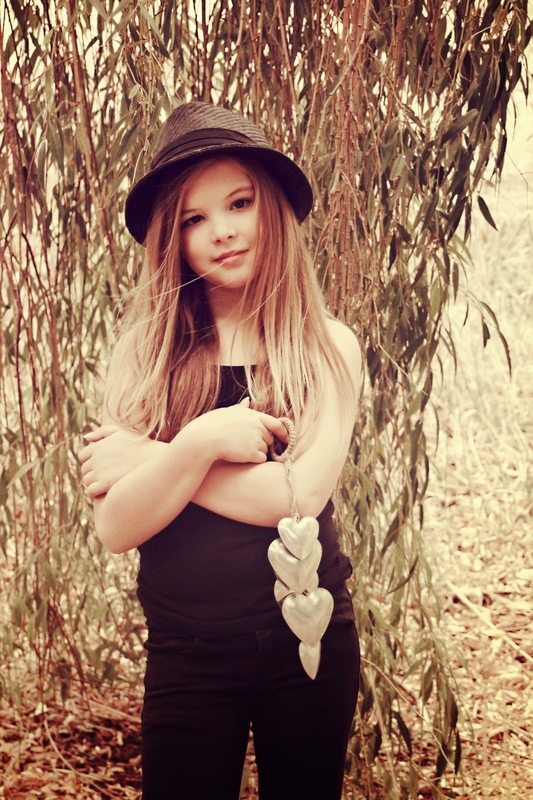 I love Vintage and I decided to use a photo of my beautiful Grand daughter Ella Jai taken by my talented daughter Tara .The sepia photo has been de-saturated, to create an aged look. Below is my completed Layout . 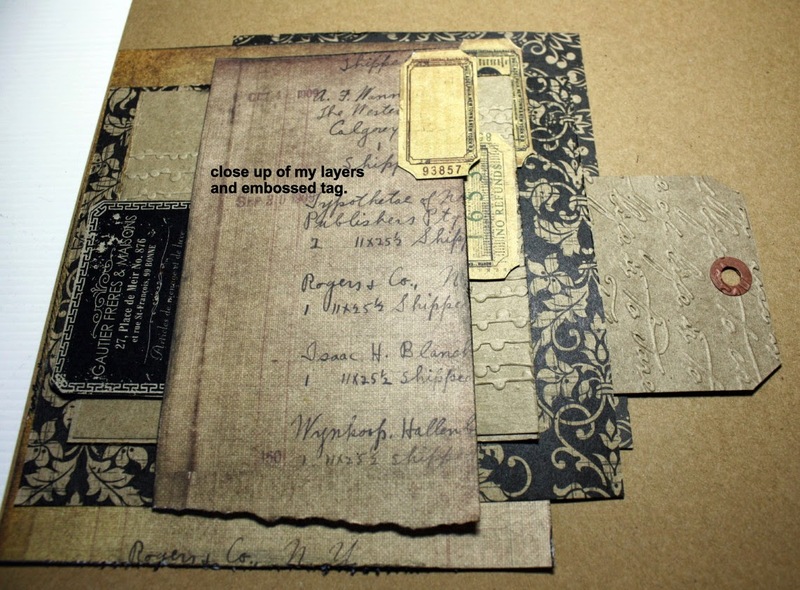 I feel by having a kraft BG , this immediately suggests Vintage .All things Vintage and aged Old Keys, Sepia photos , chipboard, earthy/rusty colors, clocks, kraft and lace . 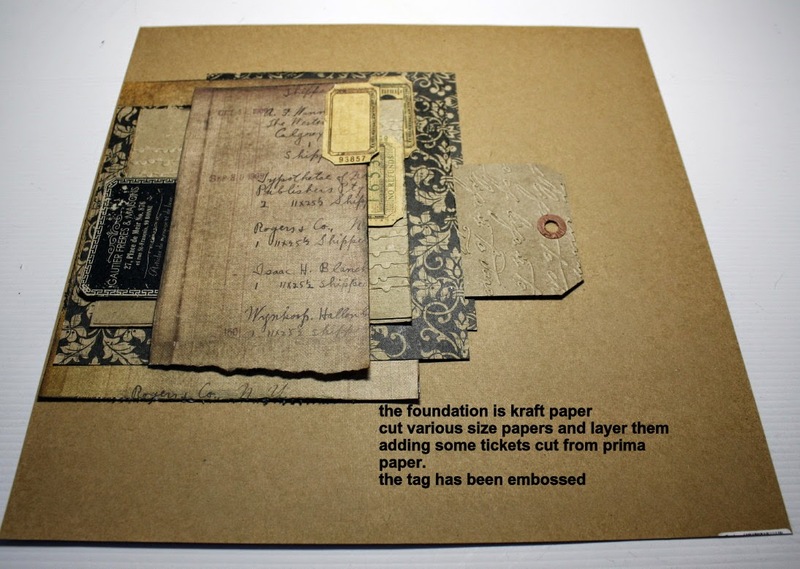 The second tag is folded around the edge of the Layout . the chipboard has been colored with Distress stain / Rusty hinge . 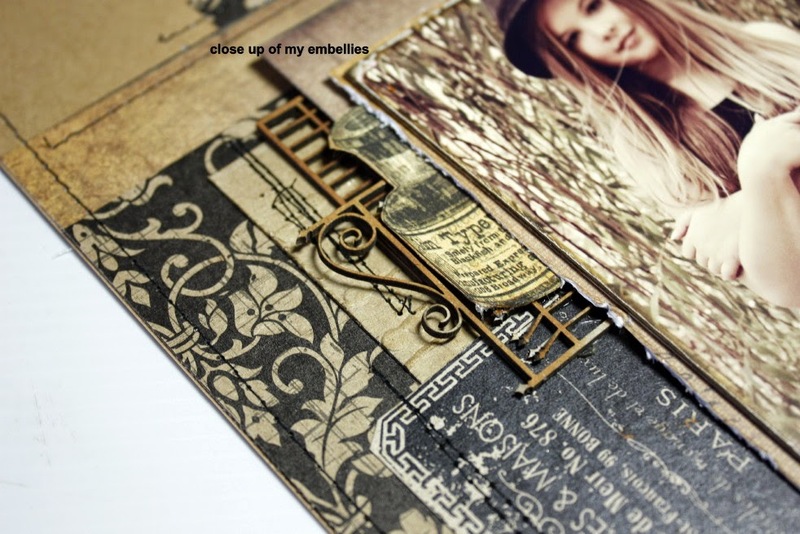 Stamping and layering add interest and texture and also add to the Vintage feel . I like to position my embellies around the page, moving them until I am happy . Finally I adhere them with glue . 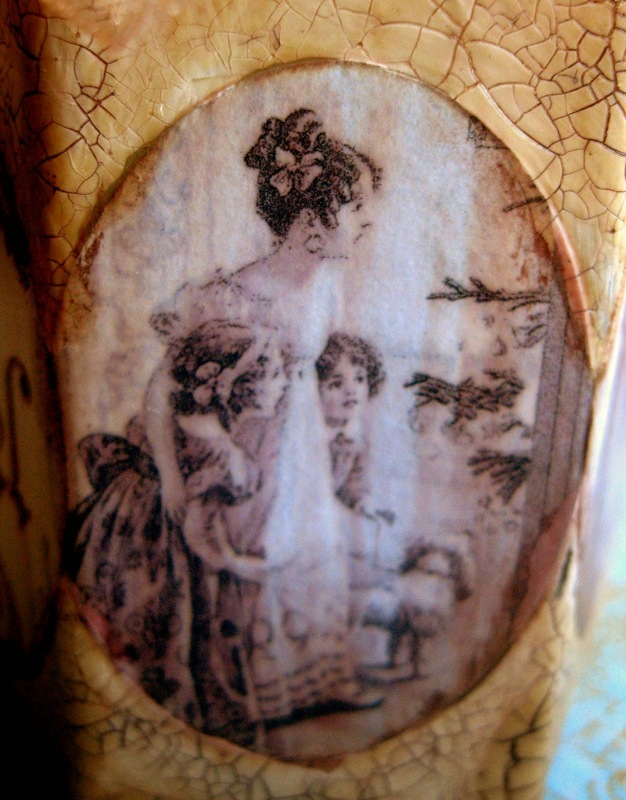 The Dusty Attic chipboard title has been altered with Rusty Hinge Distress stain and then I stamped with a Kaiser stamp in black soot distress ink. Apply Ranger Distress Crackle Paint /Clear rock candy ..I use a palette knife to avoid brush strokes. When the crackle is dry (I usually leave to dry overnight for the best effect ) I apply some black paint by dabbing over the crackle and then wipe the excess off with a wipe. Love this effect . Another look at my finished Vintage Layout . I hope you are inspired to try some of these vintage techniques. 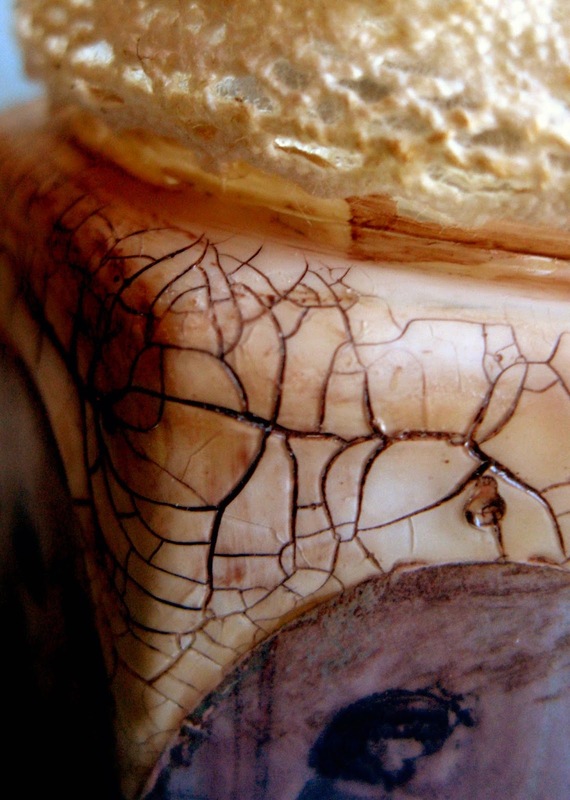 I feel the crackle gives a rich interesting effect .Thanks for looking at my work .